It’s now just two months from the release of the second Arvo Thorson mystery, Broken Down. You may preorder print versions at Amazon, Barnes and Noble, or your favorite Indie bookstore. eBooks will also be available when the book is released. Events will be held in late September at the Galleria (Edina) and Roseville (Har Mar) Barnes and Noble stores. More events are coming. Check my events page for details or watch for updates closer to the release date. I hope to see you at my events! Can’t wait to hear what you think of the book – below you can find what the pros think of Broken Down. 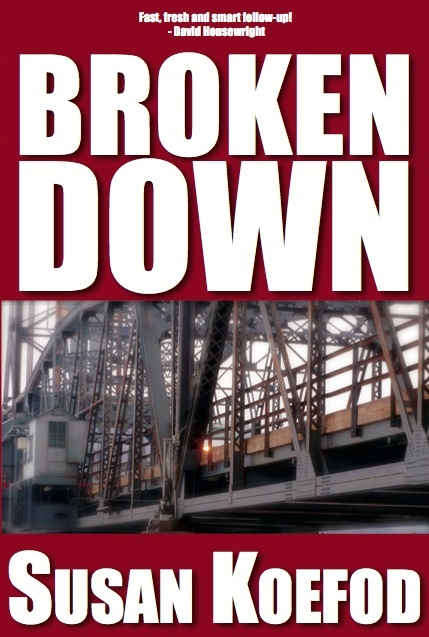 In Broken Down, the death of a swing bridge operator is clearly no accident and a troubled 15-year-old boy and the aging bridge are both under suspicion for murder. Detective Arvo Thorson is having a breakdown of his own: a drinking binge makes him all too vulnerable to his ex-wife’s treacherous charms, and may put the cork in his romance with social worker Christine Ivory. Meanwhile Christine is burnt out from too many years working with Mendota County’s youngest crime victims and she’s ready for a change, even if that means leaving Mendota County, and Arvo, for good. Book includes discussion group guide. “Koefod fulfills the promise of her debut novel Washed Up with this fast, fresh and smart follow-up. Broken Down is the next step in what promises to be to be a first-rate series. Print and ebooks available at Amazon, Barnes and Noble, or your favorite Indie bookstore. This entry was posted in Uncategorized and tagged book, ebook, events, fiction, mystery, series. Bookmark the permalink.